It’s simple to define the attributes of a winning ad on any of the platform but to get a clearer picture nothing can work out better than an actual example itself. Here, we will talk about LinkedIn Ads, referring to campaigns that drove outstanding results. And, so, you can take out best strategies & practices to let you bring maximized impact through your LinkedIn campaigns. Adobe, a global leader in digital marketing and digital media solutions was concerned towards raising brand awareness for its digital marketing solutions and capturing the attention of hard-to-reach marketers. 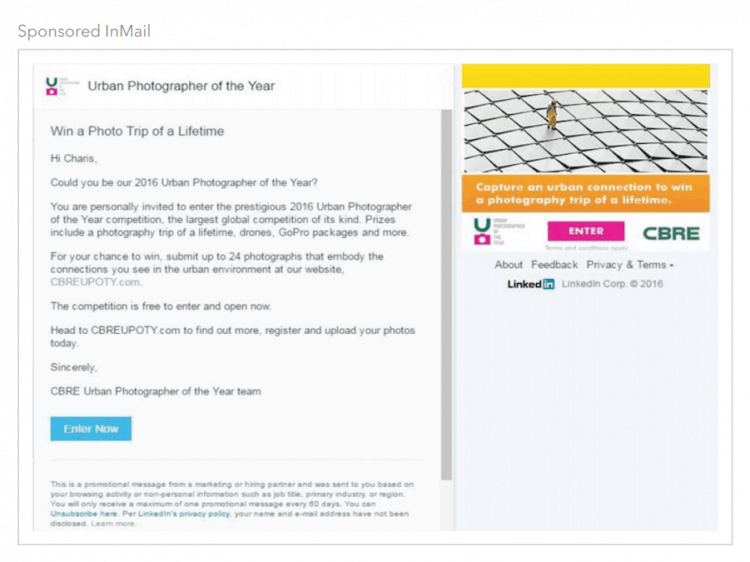 So, the brand used LinkedIn’s publishing platform to overcome the challenge. Through Sponsored Content, Adobe shared important updates in the LinkedIn feed which were targeted at marketing executives, radically increasing their awareness for brand’s digital marketing solutions. The effort helped Adobe to strengthen its name as a leader in digital marketing. CBRE, a commercial real estate services and investment firm had already kept LinkedIn as a key ingredient in its go-to-market strategy. But, now it was looking forward to take a more consumer-centric approach. With a primary goal of increasing contest entries overall, CBRE followed a combined approach of considering LinkedIn’s wide-reaching network and Sponsored InMail’s demographic and interest-based targeting filters. Results were exceeding expectations and benchmarks. CBRE’s 2016 Urban Photographer of the Year competition received more than 29,000 entries (a 41% increase from 2015). As a large part to the effectiveness of its LinkedIn campaign. Sponsored InMail produced a significant amount of qualified web traffic compared to other paid media channels. Australian software company IR was in search of a marketing solution to let them closely monitor performance and make changes right away referring to low-performing campaigns. They wanted to reduce the cost per lead, accurately track performance across the entire customer journey, and reach a focused audience. After enjoying steady results with its Sponsored Content campaigns, IR kicked up things with mobile friendly landing pages and further, decided to test LinkedIn Lead Gen Forms. The carrying out empowered IR to drill down to the right people by overlaying different targeting filters, including skills, interests, and group memberships and also leveraged geotargeting filters to support the efforts of sales teams across regions. 44% reduction in cost per lead. HubSpot, a well-known marketing software brand keeps on doing well in its lead-generation efforts, yet remains in need of uncovering new audiences and customers. After getting mixed results with ad campaigns on other social networks, HubSpot moved to LinkedIn as admiring its powerful targeting features and professional audience reach and saw a 60 percent increase in click-through rate by running brief, to-the-point Text Ads. CA Technologies, an enterprise software solutions company brought a whitepaper and wanted to get it out to the right people. It was getting clicks on other social channels, but people were not moving through to convert. The results were disappointing and, so, they turned to LinkedIn. 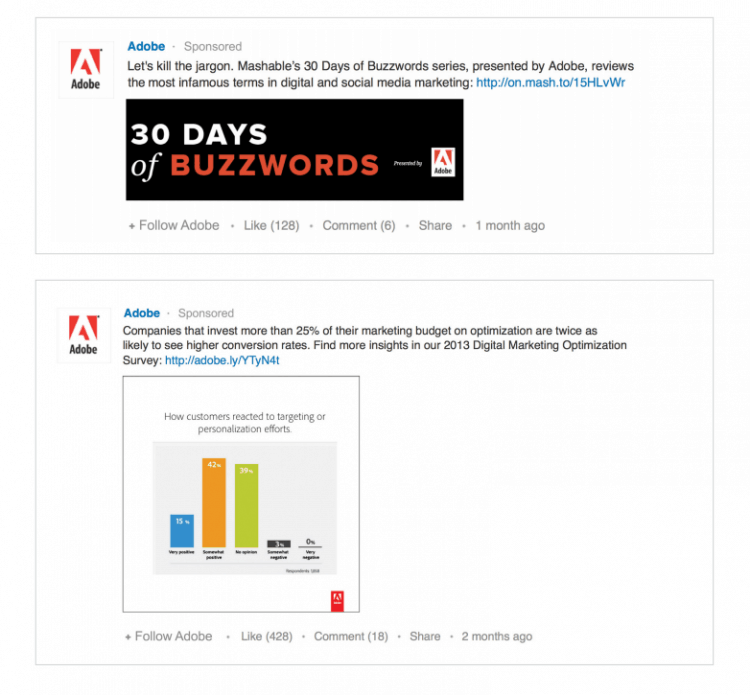 CA used LinkedIn Dynamic Ads combining profile images with a brand’s name and message. ”The native ads were appealing and eye-catching, including a profile picture and allowed CA to include more ad copy to better promote its content. The promotions proved highly engaging, leading to a brisk increase in conversions and a 68 percent reduction in CPL. Clever Zebo (www.cleverzebo.com) is a San Francisco based marketing agency and for one of its corporate training client, needed to reach a limited but highly influential group of executives interested in learning about in-depth training curriculums for business leaders. To promote the webinar and encourage registrations, the brand turned to LinkedIn. Clever Zebo served Display Ads and targeted them based on job function, seniority level, and company size to reach this desirable audience, testing and optimizing for the best click-through rates possible. The efforts paid off as the campaign generated a strong 15 percent conversion rate and compiled plentiful quality leads. The examples above can help you know LinkedIn’s targeting capabilities, widespread engagement methods, and go-ahead features in a best possible way and so, you can stand out and reach your most important audience.